The scent of Elixir of Love comes from a Victorian-era formula discovered in the archives of Caswell-Massey. It centers around the fragrance of the Passionflower which blooms only one day each year but inspires the love of a lifetime. Elixir of Love Bath Soap, scented with a combination of Passionflower, Jasmine, Musk and a touch of spice, is captivating. Layer the subtle scent with Elixir of Lovespray and body lotion to walk in a hue of lovely flowers all day long. Cleanse and refresh your body with the luxury of this classic Caswell-Massey fragrance. The paraben-free and sulfate-free formula is never tested on animals and safe for even the most delicate skin. The scent that inspires a love that lives forever has overtones of Passionflower blossoms. This soap is sure to impress. Caswell-Massey’s Elixir of Love No. 1 Bath Soap Gift Set includes 3 bars of triple-milled soap. 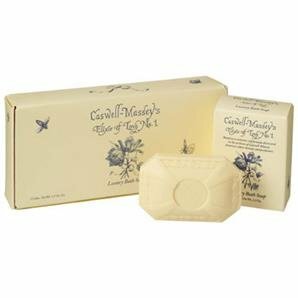 Each bar is pressed from authentic antique hand molds with floral carvings and the Caswell Crest. They come in a gorgeous box with Caswell-Massey illustrations throughout.